Honolulu Yamaguchi Kenjinkai and delegation from Iwakuni City Yamaguchi Prefecture, Japan. Along with my role as a JETAA Hawaii officer, I have made an effort to be apart of a local kenjinkai here on Oahu. I have been a member of the Honolulu Yamaguchi Kenjinkai (HYK) since last spring. Since joining the group, I have been introduced to many of the members, which includes Honolulu city council member Ann Kobayashi, and participated in some of their very enjoyable events. The most recent event I took part in happened on the evening of October 10th at the Pacific Beach Hotel in Waikiki. On that evening, various members of HYK were invited to a reception hosted by the mayor of Iwakuni City (Yamaguchi prefecture) along with members from the Iwakuni Chamber of Commerce. 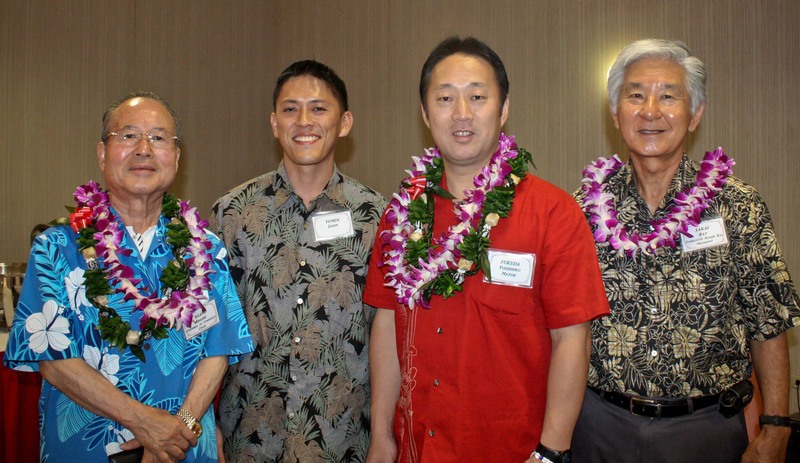 They were in Hawaii as apart of a delegation of 200 some odd members going to Kauai to celebrate a 50-year anniversary celebration for the sister city relationship between Kauai and Suo Oshima in Yamaguchi, Japan. I learned from HYK President, Mr. Ray Sakai, that HYK was a combination of a number of separate kenjinkai that came together a few years back. One of the kenjinkai that was integrated into HYK was the Iwakuni kenjinkai. Some of the HYK members today still maintain contact with their family members in Iwakuni and in other cities across Yamaguchi prefecture. The evening started off with a performance of traditional Yamaguchi dance. The Japanese performers danced throughout the banquet room in unison. They moved with grace and smiles on their faces. Many of the HYK members in attendance actually joined in. This showed that the connection between some of the kenjinkai’s members and their ancestral customs were still quite strong. After the performance, speeches were given by HYK president Ray Sakai, Iwakuni City mayor Yoshihiko Fukuda, and Iwakuni Chamber of Commerce chairman Hisashi Nagano. It was pleasant to see that though the speakers could not speak a language other than their native tongue all that well, they made an effort to do so. It was also interesting to hear that these two groups, HYK & the local government delegation from Yamaguchi, have met before in years past. I am glad to hear that as a member I will continue to have the opportunities to be apart of events like this in the future. As the speeches and toast was made, guests lined up at the buffet lines to enjoy a delicious buffet dinner provided by the hotel. The guests were intermingled throughout the banquet room. You could hear a lot of Japanese and broken-Japanese being spoken. The one thing is for sure: the atmosphere was very relaxed and pleasant. Two of the dancers were seated at my table along with one of the HYK officers, two Fukushima kenjinkai officers, and a fellow JET alumnus who serves in the military. It was nice speaking Japanese since I do not get to practice it too often. I also spoke a lot about my ancestry and some of the things I do as a JETAA Hawaii board member. Most of the delegation I talked to have heard about the JET Program. I was actually thanked by some of the delegation members for having taken part in the program. It goes to show how reputable the JET Program is. The night wrapped up with closing speeches, gift exchanges, and photo taking. I thought the event was a very good one. I very much hoped to take part in events in which I can directly interact with Japanese organizations. Being a part of a kenjinkai can provide that type of event. Continuing to promote intercultural exchange is something I feel I can do as a JET alumnus. HYK is not the only kenjinkai looking for JET alumni support. JETAA Hawaii often receives invites from various kenjinkai seeking for volunteers to assist with welcoming Japanese guests and/or to take part in some sort of event. With the declining number of members throughout many of the kenjinkai here in Hawaii and wonderful events they provide, I encourage all JET alumni to look into joining a kenjinkai. Los Angeles Kenjinkai will be host to the next Yamaguchi Grand World Conference in Fall of 2015.Hope members of HYK will be able to attend. More info to follow on our FB page. Sincerely, Steven Tani – Yamaguchi Kenjinkai Los Angeles FB page admin.